i got this one… and the matching towel! i can comfortably (HAH!) say that the Bathrobe Company’s bathrobes are THE. BEST. BATHROBES. EVER. the towels themselves are the finest deep-pile, pure cotton jacquard, and the robes are made from the towels in suffolk, england. they’re double-thick with looped terrycloth towelling on the inside and on the outside it’s sheared, which makes the softest and lovliest velour which makes them even MORE magnificent! 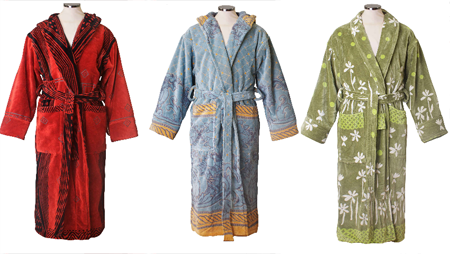 so ok, they’re on the pricey side (a robe and towel will set you back a couple of hundred quid plus), but if comfort, quality, and luxury are your thing, then these are the ONLY bathrobes for you. the one i have is called Renaissance, and husband has the Honey one. 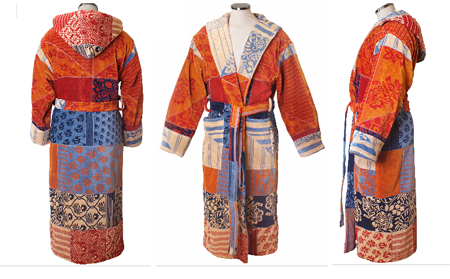 the pseudo-pretentious me wants to add the Red Diamond shawl collar robe and matching towel to my collection… or maybe the Cornucopia one… or perhaps the Praticello one? This entry was posted in i like my stuff, lounging, luxury, the world's greatest and tagged bathrobe company, bathrobes, best bathrobe ever, lounging, world's greatest bathrob. Bookmark the permalink. I was on a quest for the worlds best bathrobe as a gift for my wife when I found this article. Praticello and two matching towels are on the way. Thanks for the link and review! that’s awesome, and you are so welcome! she’s gonna be THRILLED! thanks for visiting my site, and i’m glad i could help you find your wife’s present! happy new year n’stuff! I agree, these robes are very very nice. How often do you wear them? I m sure they look cute and feel comfy.